Unfinished FEMA Flood Maps Put Sandy Victims In Limbo Besides disaster assistance, FEMA also oversees the creation of flood maps, which are then used to set building codes and flood insurance rates. Superstorm Sandy struck as FEMA was updating those maps, and now some homeowners looking to rebuild face an expensive choice. 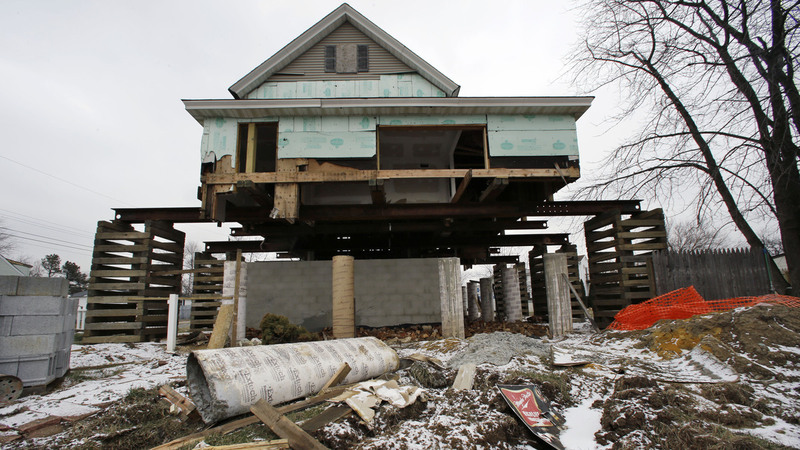 A home damaged by Superstorm Sandy in Union Beach, N.J., sits on a raised platform to protect it from future flooding. Superstorm Sandy pummeled the East Coast six months ago, and, as with other natural disasters, the Federal Emergency Management Agency was there from day one, finding people temporary shelter and later supporting rebuilding efforts. FEMA also has a lesser-known role. It oversees the creation of flood maps, which model the risk of flooding in different areas during storms. These maps are also used to set building codes and flood insurance rates. In New York and New Jersey, FEMA is updating those maps, and so far many homeowners don't like what they are seeing. Sitting in a makeshift office in his garage, George Kasimos is "FEMA-ing." That's what he calls the research and organizing he does with a group he started called Stop FEMA Now. "FEMA is flying by the seat of their pants," Kasimos says, "and we have to rebuild our homes with their seat-of-their-pants rules and regulations." The first floor of his house in Toms River, N.J., flooded during the storm and he had to gut it. He says the construction could have been done in January, but he stopped work for a few months when FEMA released a new version of its flood maps, which are used to set insurance rates. "I thought I was on that show Punk'd, to be honest. I just didn't believe it," he says. Kasimos figured if he doesn't raise his home by 4 feet, his flood insurance would go from $1,000 per year to $15,000 per year. Because on these new maps, Kasimos is now in what's called a Velocity Zone, or V Zone. This means that in a "hundred-year storm," FEMA modeling predicts waves three feet or higher would hit his home. Kasimos is supposed to elevate and put his house on pilings, which means lifting it off its foundation, moving it out of the way, and plunging big telephone poles into the ground for his house to sit atop. But Kasimos lives on a lagoon, not the open ocean. So he thinks he should be in an A Zone, at risk for flooding, but not wave damage. In an A Zone, he'd still elevate, but he could skip the costly pilings. "In an A Zone, it cost about $50,000 for an average home ... for a V Zone, it's about $150,000," he says. Kasimos took his plight to Facebook, and now has more than 3,500 likes for his group; they've started meeting near-weekly. "We do anticipate the V Zone in certain areas becoming smaller, it is an advisory product," FEMA's Bill McDonnell says. McDonnell says he agrees the maps are a work in progress. When Sandy hit, FEMA was already two years into a project to update the flood maps, which in some areas dated back to the 1980s. It generally takes 3-5 years to finish, but FEMA decided to release an early version, like a rough draft, so that people could have the most recent data available to decide how to rebuild. "[It was] just out there for informational purposes, and then the state of New Jersey adopted it as a land use policy," he says, "so that if people were going to rebuild, they have to rebuild to that standard." So the "advisory" maps basically became building code for repairing properties that have substantial storm damage. The state didn't want people to rebuild based on old data and have to lift their houses higher later. FEMA says the maps will change, but the number of people affected and the requirements for rebuilding will only decrease when the maps are finalized. That leaves Jersey Shore homeowners, like Kasimos, to decide whether to do work on their homes now that they may find out later wasn't actually needed. Kasimos has decided to rebuild without elevating for now. He's trying to fix only what he has to in order to get back to normal. Even then, he's still doing work he'll have to tear up when he eventually elevates. "[I'm] going to have to take apart the deck, my stairs, the siding, things like that, absolutely," he says. FEMA says it understands the urgency and is moving as fast as it can. It expects to start releasing a new version of the maps county by county, perhaps as early as June.